Fifty million Americans have chronic headaches. Twenty-eight million of them — mostly women — get debilitating migraines. Besides the incalculable pain and suffering, the financial burden is staggering. Research studies show that employers and employees spend more than $1 billion each year on medical treatment for chronic headaches — a condition that costs business an estimated $13 billion in lost productivity due to inefficient and missed work. Despite billions of dollars spent on research and treatment, the suffering of headache patients persists, and may continue to do so for decades. Because the underlying causes remain unknown there’s little wonder why headache patients become increasingly frustrated in their pursuit of a cure and find little relief. Regular use of medications designed to manage the cycles of pain may often complicate the original headache syndrome, making it even more difficult to resolve. Reported side effects of medication may include dizziness, loss of appetite, nausea, vomiting, diarrhea or constipation, gastric bleeding, and sedation, not to mention an increased risk of stroke. Rebound headaches can also be caused by the very medications that are used to treat them. When anyone comes into my office with chronic headaches of any kind, the first thing I ask them is if they are on any medications. Birth control pills usually have headache listed as the number one side effect. Other medications may also be causing headaches. Other causes can be food allergies that cause the headache itself or cause the muscle tension that leads to the headache. Common food allergens such as dairy foods, wheat, bananas, oranges and others can also cause headaches. In women hormonal imbalances often play a factor. Whether they directly cause the headache or just add to the muscle tension again is really unknown. On the emotional side, getting regular migraines and headaches can cause such debilitating pain that the person starts to live in fear of getting a headache. This further can add to the stress that causes headaches. There are a few research studies that show that massage for the relief of headaches looks promising. I have seen quite a few people through the years with varying kinds and degrees of headaches. One such case was a woman with daily headaches for a year or more who after getting regular massage realized that she hated her job and really wanted to pursue other dreams. She quit her job and the headache went away that easily. Now I am not saying that can happen for everyone but it just adds fuel to the fire for figuring out why people get headaches and how headaches and massage can be a call to make life changes. If you are having headaches regularly each week it is important to be checked out by your physician to rule out more serious causes of headaches. Your insurance may cover your massage for regular headaches. 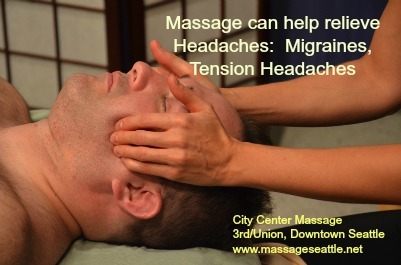 Often the amount of headaches one gets can be reduced with massage. Getting regular massage for about 2 months or so should help us know whether it will work or not for you.